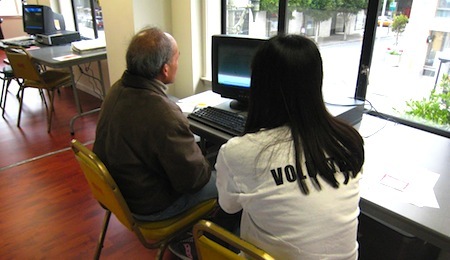 SF Connected is an initiative that provides free computer tutoring and support to seniors and adults with disabilities in the San Francisco area. This program seeks to teach computer and Internet skills to seniors by teaching them how to use broadband technology such as social media and video communication. Seniors are provided with free classes to learn basic computer and Internet skills as well as social media tools to help them overcome social isolation. SF Connected is funded by a Broadband Technology Opportunities Program (BTOP) grant. Half of the grant was given to the Department of Aging and Adult Services (DAAS) to organize a digital initiative for senior and adults with disabilities, which then became SF Connected. Seniors are provided with extensive training with computers and broadband connections from senior centers, adult day services, and supportive housing sites. Self-Help for the Elderly provides computer classes in Chinese, English, and Vietnamese. To learn more about SF Connected and how to get involved, call Self-Help for the Elderly today.